Apparently there are lots of stories on the internet about Bill Murray doing some crazy spontaneous things where he crashes a party or a wedding picture session, comes behind someone in a public toilet and puts his hands on the person eyes saying “No one will ever believe you”, or ends up doing the dishes in some kid’s apartment. He just shows up out of the blue, acts like he is just a normal guy (not a celebrity) but in a way that touches people’s life. Could those stories be true? That’s the question which Tommy Avallone asked himself and decided to make a documentary about it. 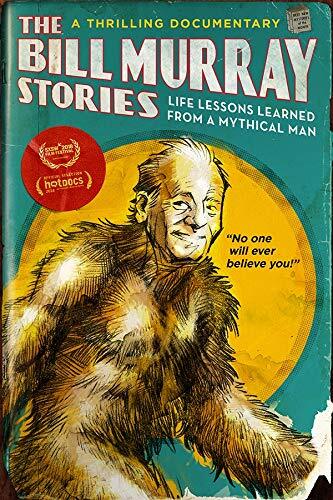 The Bill Murray Stories: Life Lessons Learned From a Mythical Man is a documentary that retells those stories and interviews the people who experienced them. It really seems that most stories — at least those told in the documentary — are true and there is pictorial or video evidences to prove it. Avallone then goes on asking himself: why? Why someone like Bill Murray would do such things? To goof around? As a publicity stunt? Not at all. It is just who Bill Murray is. It is part of an improv thing and part of a life philosophy (something like taoism or zen). He just like to live in the moment and make people happy. Personally, I am just wondering what makes people wake up in the morning and decides to make a documentary about Bill Murray. You are in movie school and need to do one as an assignment? Or really want answers to those questions and decide to just films everything and try to make money out of it? Or you just have the “reporter” gene in your blood? I guess someone should make a documentary about that. Apparently, Bill Murray is quite an interesting person. But whether you are interested or not, whether you like documentaries or not, it doesn’t matter: if you just take the moment to watch this sixty-seven minutes movies you will certainly enjoy it. And maybe, maybe, you’ll take something out if it and wonder, like me, could I ever be that spontaneous and really live in the moment?